The California convention season got started for me this weekend with WonderCon. 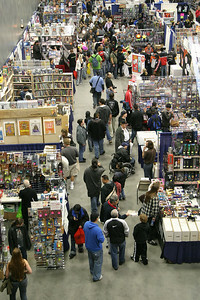 WonderCon is produced by the same group that handles Comic-Con and the Alternative Press Expo (APE). After existing in Oakland for a number of years, it migrated over to San Francisco’s bigger venues. Unfortunately, it’s coincided with the Game Developers Conference the past two years and has been squeezed into Moscone Convention Center‘s South Hall after a turn in the newer and visually impressive West Hall. The South Hall fits well but the layout makes the overall show feel cramped and the location for some of the smaller panel rooms is not ideal for good foot traffic. WonderCon has become mostly a TV and movie panel show for me while I concentrate on shopping and autographs at Comic-Con. Compared with the insane lines at Comic-Con, it’s relatively easy to get a good seat and see actors, writers and directors of current and upcoming genre shows. This year had well known television shows and movies like Get Smart, X-Files 2 and Terminator: The Sarah Connor Chronicles represented. Actors and creators like Steve Carell, David Duchovny, Gillian Anderson, Chris Carter and Anne Hathaway took the time to show up and answer audience questions. It was a nice, relaxing weekend. Pictures from the panels and the exhibit hall are available for your enjoyment. Why am I talking about this? Well, after a couple of months of minor spam comment postings, my little blog fell under attack in the last day with dozens of bogus comments advertising all kinds of gambling services. Most got flagged as needing moderation but a lot still made it through and needed to be manually gotten rid of. If you’ve seen the commenting area of a post, you’ll notice I’ve been using reCAPTCHA to help prevent spamming. Since it’s turned out not to be an end-all solution, I started to look at alternatives. First step was to straight away ban the most common IP addresses. Current WordPress versions have this as an option. Since the traffic and number of comments is very light, I don’t think there’ll be much collateral damage to legitimate posters. It’s also possible to alter the .htaccess file to totally deny access but that felt to be a bit much since I’m not really under a heavy attack. As a longer term solution I’m looking to see what other options are out there. A couple of notable are Spam Karma 2, Peter’s Custom Anti-Spam Image Plugin and Bad Behavior. Depending on how effective updating to the latest reCAPTCHA and just blocking annoying IP addresses turn out to be, I’ll take a look at these solutions. Thanks to a posting on Jammed for some of these plugin pointers.